As homeowners, it would be great if we all had mind powers and could tell exactly what was going to go wrong with our homes and when. Although we aren’t able to see the future here at Davis Heating & Cooling, we’re pretty good at predicting it by understanding the warning signs of a failing furnace in your home. In this blog, we’re going to share a few of these with you, but if you have any questions, don’t hesitate to contact our heating and cooling experts today. Most furnaces nowadays last between 16 and 20 years. Although this is the standard, if your HVAC system wasn’t repaired regularly or had several major breakdowns throughout its life, it may not last that long. You may need to do some digging through its history to estimate how much longer it will last. We’ve said it before and we’ll say it again: there’s no reason your utility bills should be spiking up for any reason unless your furnace is failing or you’ve just made it through an unusually long cold spell. Don’t just shrug these off as non-issues, be sure to contact your furnace repair expert immediately to have it checked. Ask any furnace repair company out there and they will likely tell you the same thing, “if your furnace is making strange noises, it’s almost always a sign of trouble.” Just like your car, your HVAC system doesn’t usually run loud unless it’s running inefficiently. Contact us immediately if you start hearing clunking noises, thumping, or any other strange noises. 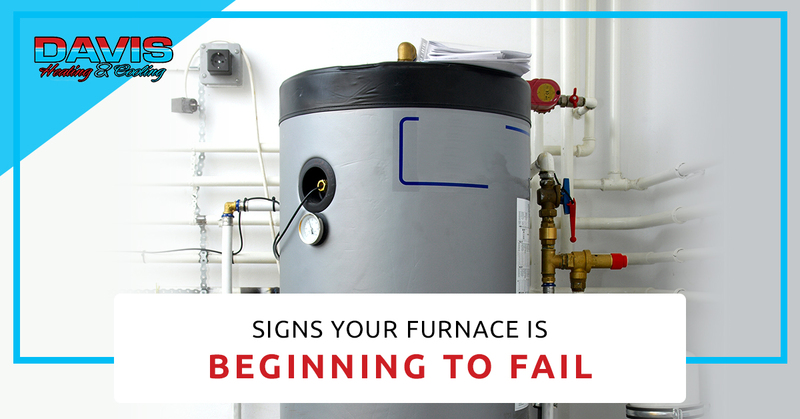 Your home and furnace itself may also give you warning signs that something isn’t quite right. If you notice a strange smell around your home, there are streaks of soot or dirt around the furnace, or the burner flame in your furnace is yellow instead of blue, you may have a serious problem on your hands. If your furnace is shutting off frequently before your home is heated, it could be a sign that there is an issue with the connections between your thermostat and your furnace or that the furnace is beginning to fail. When you call Davis Heating & Cooling, we can check all aspects of your system to ensure it’s not something related to the thermostat. If it is, we offer a variety of options for you to replace it. We highly recommend upgrading to a programmable thermostat if you haven’t done so already. If you’re experiencing one or more of these issues, we highly recommend giving us a call here at Davis Heating & Cooling. It’s not necessarily the case that your furnace is about to fail but it’s usually better to be safe than sorry if something doesn’t seem quite right with it. We’d also be happy to schedule regular maintenance services with you if you want to prolong the life of your system.